Albania: Albania a(w)l-BAY-nee-ə; Albanian: Shqipëri or Shqipëria; Gheg Albanian: Shqipni or Shqipnia also Shqypni or Shqypnia), officially the Republic of Albania (Albanian: Republika e Shqipërisë, pronounced [ɾɛpuˈblika ɛ ʃcipəˈɾiːsə]), is a country in Southeast Europe on the Adriatic and Ionian Sea within the Mediterranean Sea. It shares land borders with Montenegro to the northwest, Kosovo to the northeast, North Macedonia to the east, Greece to the south and a maritime border with Italy to the west. 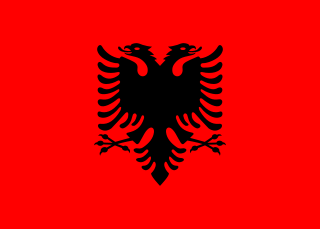 Albania national football team: The Albania national football team is the men's football team that has represented Albania in international competition since 1946 and is controlled by the Albanian Football Association which is headquartered in the city of Tirana. The team is affiliated with UEFA and competes in the three major professional tournaments, the FIFA World Cup, UEFA European Championship and the UEFA Nations League.